We would like to thank you for your interest in our All About Kids Childcare and Learning Center at Wards Corner! Our state of the art facility boasts a bright and spacious building and three outdoor play areas. Both the classrooms and outdoor areas are separated by age groups which allow us to design specific activities for each group. All About Kids at Wards Corner goes beyond just being a childcare facility, we are a learning center. We strive to engage and challenge children of all ages throughout the day with individual and teacher facilitated activities. All About Kids at Wards Corner is committed to partnering with parents in the best interests of each and every child. Our number one goal is to provide each child with the tools they will need to advance in education and to be prepared for the ever changing world around them. Our learning center offers families a nurturing environment combined with caring and well educated teachers that work with families to build a solid foundation for their children. Are you interested in opening your own All About Kids center? 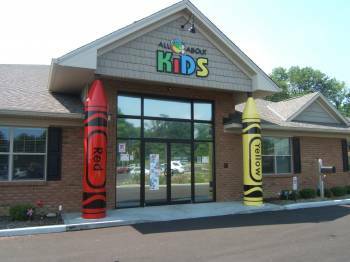 Click here to learn more about opening an All About Kids Childcare and Learning Center franchise.